To qualify for the Wisconsin Track Coaches Association All-State Team, athletes had to finish in the top six for all three divisions combined in the finals at the 2016 WIAA State Meet. 100 Meter Dash: 1 Ja'Cey Simmons FR Milwaukee Lutheran 12.25;; 2 Tanesha Davis SR Racine Horlick 12.29;; 3 Maddy Pietz SO Wittenberg-Birnamwood 12.37;; 4 Makayla Jackson FR Milwaukee Rufus King 12.42; 5 Azya McLin SR Wauwatosa West 12.54; 6 Annalise Peebles SR Appleton North 12.56. 200 Meter Dash: 1 Brooke Jaworski FR Wausau West 24.77; 2 Ja'Cey Simmons FR Milwaukee Luthern 24.91; 3 Kiersten Walker JR Milwaukee Rufus King 25.04;; 4 Alexandra Hutchison SR Columbus Catholic 25.06; 5 Nadia Williams SR Mount Horeb 25.09 6 Grace Hartman JR Wisconsin Rapids 25.11; 6 Autumn Wickman SR Athens 25.11. 400 Meter Dash: 1 Brooke Jaworski FR Wausau West 54.33; 2 Bianca Stubler JR Hamilton 55.38; 3 Alyson Weum JR Stoughton 56.34; 4 Val Larson SR DeForest 56.38; 5 Autumn Wickman SR Athens 56.45; 6 Kiersten Walker JR Milwaukee Rufus King 56.53. 800 Meter Run: 1 Cami Davre JR Whitefish Bay 2:11.13; 2 Sydney Currie SR Cambridge 2:11.80; 3 Audrey Janik JR Wisconsin Lutheran 2:11.92; 4 Samantha Valentine SR Middleton 2:12.15; 5 Emma Langer SR Waukesha W 2:12.24; 6 Becca Langer SO Waukesha West 2:12.79. 1600 Meter Run: 1 Cami Davre JR Whitefish Bay 4:46.40; 2 Samantha Valentine SR Middleton 4:46.87; 3 Aubrey Roberts SR Eau Claire Memorial 4:47.66; 4 Audrey Janik JR Wisconsin Lutheran 4:59.46; 5 Leah Neustedter SO Brookfield Central 5:00.73; 6 Mason Kalander SO Holmen 5:02.35. 3200 Meter Run: 1 Aubrey Roberts SR Eau Claire Memorial 10:13.68; 2 Alicia Monson SR Amery 10:40.10; 3 Dana Feyen FR Gale-Ettrick-Trempealeau 10:48.39; 4 Audrey Janik JR Wisconsin Lutheran 10:53.18; 5 Rachel Werking SR Brookfield East 10:58.83; 6 Sarah Ziolkowski SR Whitewater 10:59.07. 100 Meter Hurdles: 1 Mikaela Grant SR Jefferson 14.69; 2 Meghan Pingel SR Lakeside Lutheran 14.72; 3 Alexis Jackson SO Oregon 14.75; 4 Lauren Smith SR Middleton 14.79; 5 Alexandria Bullen SR Brookfield East 14.91; 6 Siarah Jones JR Milwaukee Rufus King 15.05. 300 Meter Hurdles: 1 Jordan Hirsbrunnner JR Monroe 43.94; 2 Alexis Jackson SO Oregon 44.44; 3 Siarah Jones JR Milwaukee Rufus King 44.61; 4 Faith Lubner JR Reedsville 44.87; 5 Adela Diaz SO Beloit Memorial 44.93; 6 Mikaela Grant SR Jefferson 44.93. 4x100 Meter Relay: 1 Wauwatosa West 47.91 [1) Azya McLin SR 2) Mercy Ndon SR 3) Breanna Weigman SO 4) Cheri'A Adams JR]; 2 Waukesha South 47.99 [1) Daeonna Johnson SR 2) Kaylee Gessay JR 3) Jestine Green JR 4) Armoni Brown SO]; 3 Milwaukee Rufus King 48.31 [1) Ameera Fowler FR 2) Mariah Williams JR 3) Deja Bates JR 4) Makayla Jackson FR]; 4 Hudson 48.45 [1) Anika Kling SR 2) Kady Kochendorfer SO 3) Lexi LeFever SO 4) Lucy Fashingbauer JR]; 5 Kenosha Bradford/Reuther 48.50 [1) Icy Perry SO 2) Alexus Nelson SR 3) Ashlee Miller SO 4) Madison Marko SR]; 6 Racine Horlick 48.79 [1) Adriana Green JR 2) Cerriyah Gibbs JR 3) Kelsi DeRosier SR 4) Tanesha Davis SR]. 4x200 Meter Relay: 1 Oregon 1:40.76 10 [1) Maddie Le Brun: SR 2) Danica Keisling JR 3) Alexis Jackson SO 4) Scarlet Egwuonwu FR]; 2 Kenosha Bradford/Reuther 1:41.28 8 [1) Icy Perry SO 2) Alexus Nelson SR 3) Ashlee Miller SO 4) Madison Marko SR]; 3 Appleton North 1:42.39 [1) Annalise Peebles SR 2) Iris Hertting FR 3) Gabby Smith SO 4) Sydney Squier FR]; 4 Wauwatosa West 1:43.03 [1) Azya McLin SR 2) Kayla Crump SO 3) Brianna Horton SR 4) Mercy Ndon SR]; 5 Hamilton 1:43.06 [1) Amanda Hammond SO 2) Morgan Price FR 3) Elizabeth Behrndt FR 4) Taylor Klug SR]; 6 Middleton 1:43.08 [1) Hanne Andersen-Smith SR 2) Abbey Webber SR 3) Hailee Milton SR 4) Lauren Smith SR]. 4x400 Meter Relay: 1 Wausau West 3:50.75 [1) Ana Presa JR 2) Caitlin Deaton JR 3) Alyssa Faucett SR 4) Brooke Jaworski FR]; 2 Arrowhead 3:51.84 [1) Lizzy Bejna JR 2) Mary Bartelson SR 3) Grace Gilmore JR 4) Kayla Vogt SO]; 3 Hamilton 3:52.47 [1) Morgan Price FR 2) Megan Jansett SO 3) Chelsea Parker JR 4) Bianca Stubler JR]; 4 Germantown 3:53.31 [1) Rosalie Campbell SR 2) Tatum Gallenberger JR 3) Alyssa Goesch JR 4) Kenzie Schmitz JR]; 5 Waukesha West 3:53.82 [1) Maddie Frey SO 2) Becca Langer SO 3) Emma Langer SR 4) Samantha Hanson JR]; 6 Appleton North 3:54.69 [1) Annalise Peebles SR 2) Iris Hertting FR 3) Alyssa Gruender SR 4) Sydney Squier FR]. 4x800 Meter Relay: 1 Waukesha West 9:11.81; [1) Samantha Hanson JR 2) Brooke Lytle FR 3) Becca Langer SO 4) Emma Langer SR]; 2 Arrowhead 9:19.61 [1) Brynn Bartlett JR 2) Annie Schaubel SR 3) Megan Olshanski JR 4) Kayla Vogt SO]; 3 Appleton North 9:19.63 [1) Mary Rose Flood SO 2) Payton Fors SR 3) Lauren Drankoff SR 4) Sydney Squier FR]; 4 Kimberly 9:25.04 [1) Carisa Weyenberg SR 2) Olivia Eisch SO 3) Ashtyn Johnson JR 4) Hailey Ruplinger SR]; 5 Homestead 9:28.61 [1) Zanelle Willemse SO 2) Maddie Powell SR 3) Allie Levin JR 4) Katie Wegmann JR; 6 West De Pere 9:30 [1) Chloe Irish JR 2) Kaitlyn Wall FR 3) Sophia DeCleene SO 4) Brehna Evans SO]. High Jump: 1 Tara Pratt JR Appleton West 5-07.00; 2 Ashley Melvin SR Hartford Union 5-06.00; 2 Lindsey Mirkes JR De Pere 5-06.00; 2 Emily Scott SO Lakeland 5-06.00; 5 Brooke Blazei JR Martin Luther 5-05.00; 5 Alyssa Kavajecz SR South Shore/Washburn 5-05.00; 5 Hope Schneider JR East Troy 5-05.00; 5 Jaclyn Zahn SR Seymour 5-05.00. Pole Vault: 1 Kylie Swiekatowski SR De Pere 12-07.00 10; 2 Grace Kowalkowski FR De Pere 12-00.00 8; 3 Sheridan Michaud SR GB Preble 11-09.00 6; 4 Erin Neveau SR Oshkosh North 11-06.00; 4 Sydney Rau SR Westosha Central 11-06.00; 4 Jensen Van Duyse JR GB Preble 11-06.00. Long Jump: 1 Mikaela Grant SR Jefferson 18-05.50; 2 Alexandria Bullen SR Brookfield East 18-03.25; 3 Kaitlyn Kaiser SR Cuba City 18-02.25; 4 Nadia Williams SR Mount Horeb 18-01.50; 5 Armoni Brown SO Waukesha S 18-01.00'; 6 Sonia Schubert JR Elkhart Lake-Glenbeaulah 17-10.25. Triple Jump: 1 Maddie Nelson SR Hudson 38-08.50; 2 Kyra Arendt JR Bloomer 37-11.00; 3 Kiara Lee FR Madison La Follette 37-10.75; 4 Mary Bartelson SR Arrowhead 37-09.50; 5 Eva Laun-Smith JR Beloit Memorial 37-09.50; 6 Val Larson SR DeForest 37-09.00; 6 Amanda Wiebke SR Onalaska 37-09.00. Shot Put: 1 Tess Keyzers JR Little Chute 47-03.00; 2 Katie Taylor SR Hayward 46-03.50; 3 Erin Dunning JR Ashwaubenon 46-02.50; 4 Ella Schultz SR West Allis Central 45-07.75; 5 Kris Lindow SR Ashwaubenon 45-04.50; 6 Sydney Thompson JR Mercer 44' 01.00. Discus Throw: 1 Josie Schaefer JR Baraboo 162-00; 2 Sam Noennig SR Hartford Union 150-08; 3 Holly Houston SR Madison Memorial 146-03; 4 Emma Richards SO Ozaukee 144-09; 5 Erin Dunning JR Ashwaubenon 137-06; 5 Destinee Haas JR Baldwin-Woodville 134-02. Wausau West ninth grader Brooke Jaworski has been named Female Athlete Of The Year by the Wisconsin Track Coaches Association. 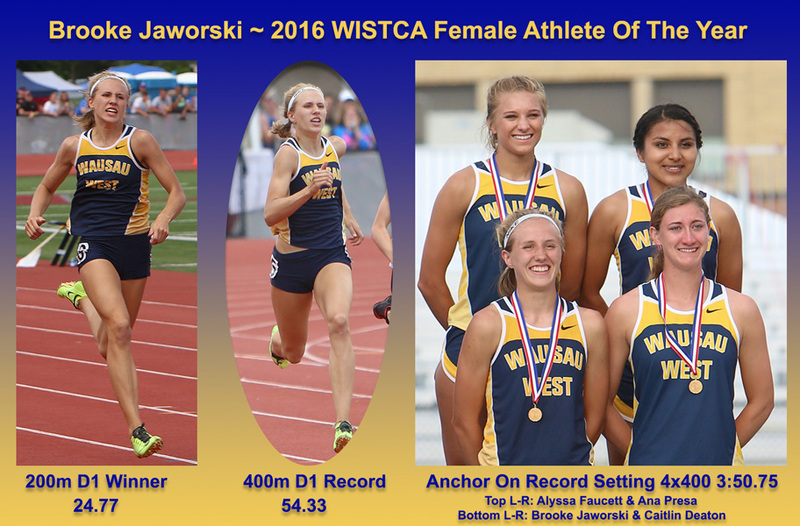 Jaworski collected three Gold Medals in her first State Meet and set a D1 record in the 400m dash and was anchor of the Wausau West 4x400 relay team which also posted a new D1 record. She also won the 200m dash with a time of 24.77. Jaworski broke the 400m record set last season by Monona Grove's Gabby Beauvais [54.82] with a time of 54.33. She then anchored the Wausau West 4x4 to a new record of 3:50.75 which broke the Milwaukee Riverside old record of 3:52.82 set in 2013.